Take a look at this investigative story in the Kansas City Star that was picked up by other media outlets across the country, including the Lexington Herald-Leader. The story, Lethal inaction: As fatal truck crashes surge, U.S. government won’t make an easy fix, ran in the Star in early September. 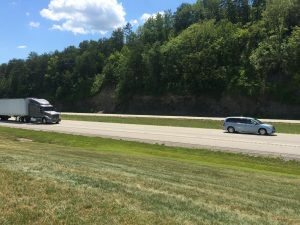 Reporter Mike Hendricks reviewed government statistics that indicate 4,300 people died in accidents involving semis and other similar large, commercial vehicles in 2016, an increase of 28 percent from 2009. What has also contributed to the increase in deaths is that roads are carrying more traffic now than they were a decade ago, and many states have raised speed limits. What could the NHTSA do? For starters, it could listen to the pleas of the National Transportation Safety Board, which has urged the NHTSA to require better safety equipment in tractor-trailers since the late 1990s. Specifically, the equipment would be automatic breaking systems and forward collision warning systems. Both of these features will be standard in new cars starting in 2022, the KC Star’s report notes. Safety advocates have pointed to the need for this for decades. The groups that have pushed for changes include the Truck Safety Coalition, Center for Auto Safety and Road Safe America. Officials from each of these groups were quoted in the story, showing frustration with the failure to act on the part of the NHTSA. These groups want to see safety measures put into place as soon as possible. For its part, NHTSA officials have indicated that they’re “studying” the issue, and have tests underway. Meanwhile, the European Union already requires this basic safety equipment on large trucks, and South Korea will require automatic braking and lane change warning technology on large trucks by 2021. The point is this: people are dying because our government won’t take a stand for safer highways. My hope is that companies that make big rigs will voluntarily add this technology because it is the right thing to do, and it will save lives, as has been proven time and again. If you or someone you love has been injured or killed in an accident with a tractor-trailer, please be sure you talk to an experienced attorney. Please reach out to me, attorney Kyle Roby, if I can help you. You can reach me at (270) 781-6500 or kroby@elpolaw.com.